There are some bad movies I’ve seen. I can get through a poorly made or poorly acted movie if it’s still interesting and enjoyable. But there are some that are so bad, I get upset I spent time watching them. This movie was quite awful. I wanted to leave the theater, this one was so bad. and I love sequels. I hated the plot, I hated the acting, I hated the characterization, cinematography, special effects, etc. You name it, I hated it. But even this doesn’t make it as the worst movie ever. If I tell you the cast, you still won’t know it. If I tell you the genre, the year it came out, or anything, you still won’t know it. It had Mark Wahlberg, Christina Applegate, and Lela Rochon. It’s a heist movie comedy. It came out in 1998. Still don’t know? Of course you don’t! It’s because this movie is so terrible you’ve literally never heard of it. Okay, I won’t leave you guessing any longer. 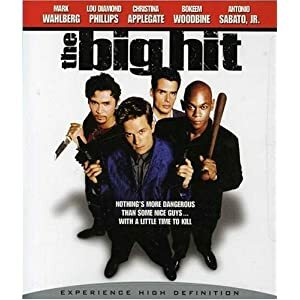 This movie is called The Big Hit. Seriously the worst movie I've ever seen. If this movie is so bad, why did I watch it? Well, it’s all the fiancé’s fault. This movie came packaged with another movie I bought several years ago. I’d never heard of it and frankly never intended on watching it. Take it from me, never watch this movie. It really surprised me because I love Marky Mark, Christina Applegate, and Lela Rochon. Their acting was the one thing that made me not shoot myself while watching this flick. This entry was posted on October 16, 2011 by Chicago-Style Girl. It was filed under Movies and was tagged with 1990s, opinions.